Allows you to link an actual product to an option so that when you add an item with that option to the cart, the option is replaced by an actual product. The HardDrive is added as its own separate product. Simple vQmod script plug and play. No files to edit or overwrite. Adds new entry to Product Edit Option tab to Enter the product ids that you want to link. 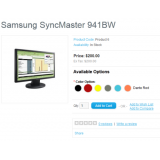 Unlimited products can be linked to an option. You could have a single option add x number of products automatically. Not Theme Dependent. Will work with ANY theme. Very useful extension if you want detailed sales report of the particular product in product form (Catalog -> Products -> Edit product -> Product Sales Report tab). Report is divided by product options, by clicking on product name you can view detailed list of customers who bought this product (with product options), purchased quantity, total amount, you can view order date, order number, invoice number and order status. There is possibility filtering by purchased date or statistics range. 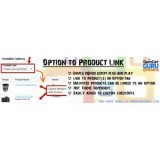 Added Sold column in product list for quick overview of sold quantity of every product. Please do not post any code related to the extension or questions related to issues with installation that you may have in the comments area or forum. Read the detailed installation instructions and if you still can't find a resolution please send me an email with full details of issue. 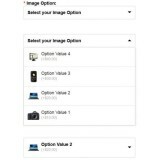 This extension allows admin to assign an unique image for each option value per product. When the option is selected on front-end, main product image will be swapped with the corresponding option image. 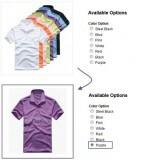 Want to have various Color Options per product for your customers to select from? Here's what you need: Product Color Option extension. With this mod you could create different images for each option value you have, is perfect for products that have different colour option. 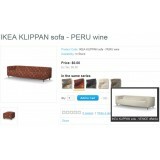 Also when you click on add to cart the option image will be instead of product image. 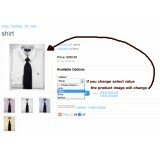 So if you buy a white T-shirt the customer will see the white T-shirt image for that option. 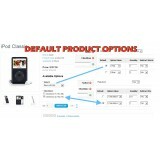 This contrib adds a new "Default" checkbox for each product option in the product edit area. It also has the option to use the defaults when adding to cart from the category or module pages. * Auto-unchecks the default box for other option values on the same option to prevent more than one default. - Does not currently work with Options Boost. Working on adding support for that. - It will work for Options Price Update Redux, but you have to set the "update on load" value to true in the OPUR xml file. - Does not work with Dependent Options. - Not sure what other mods it may or may not work with.